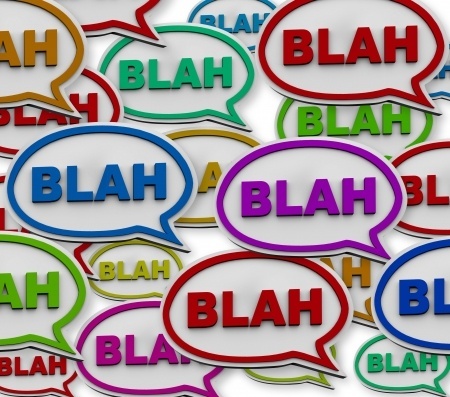 Excessive talking can be dangerous to your business and your life. Tongue-wagging may not send you to the ER with heart-palpitations, blot clots, or cancerous tumors, but it can kill many good ideas before they’re executed. Take Mike, for example. A colleague of mine and professor at a local university, Mike has been telling me for the past 10-12 years that he’s going to write a book on the fundamental skills of supervision. He even sent me a pitch letter once intended for an agent he’d met at a conference and asked for feedback. Ever since that time, when our paths cross, I ask him how the book’s coming along. He always spends 20-30 minutes telling me about “what he’s going to include in it.” As of our last conversation, he’s still not written a page. With the excitement stripped away, all that’s left is actual work. Rather than the pay-off of praise from the finished project, people feed on the payoff from promises of what’s to come. That makes executing the actual plans much less exciting—and much less likely to get done. Yes, yes, I know that the bundle is the total cost of meetings, and I’m refusing to break out the “excessive talk” as a separate line item. My company does workshops on effective meetings, so I’ve heard the complaints from victims of those meetings. Most are inefficiently facilitated. Anybody want to argue with my reasoning here? If you’re one of those people who has to “bounce” your creative thinking off other people, fine. Do it. But set a buzzer. Every game I know of has some kind of time limit. Otherwise, the idea (or conversation) turns into a life-long pastime rather than serious pursuit. Enter mentee Greg, for purposes of illustration. A creative guy, Greg helped launch a start-up organization and then got laid off. So he approached me to help him figure out his next creative venture to take into the corporate world. Each week he comes with a new focus to discuss. We talk. His creativity muscles go to work. Next week, he comes with nothing created. We start over with a new idea. We talk. His creativity muscles flex again. He leaves and returns the following week. Nothing created. Identify major deadlines and interim deadlines. Decide on the check-back points. Agree on the criteria for completion and measures of success or failure. Pinpoint pitfalls that may cause trouble and develop precautionary measures. Schedule the work. Thomas Edison got it right: “The value of an idea lies in using it.” Never be tempted to talk a good idea to death.